We have all heard the adage: Nutrition is the key to a successful diet. Well, it is true; but, it is also true for a cycling adventure, like the Dirty Kanza 200 (DK200). 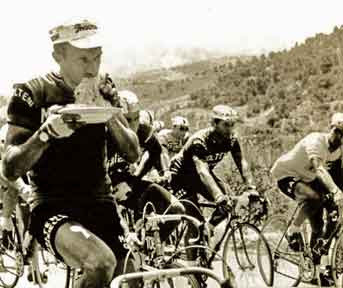 When riding your bicycle expending up to 1100 calories an hour for over 15 hours, proper nutrition is required. Think of it like this; a cold cut combo footlong is 450 calories. I would have to eat 38, that’s correct, 38 footlong sandwiches to take in enough calories to replace what I spent during the race. Two questions I had to answer before taking on one of the toughest challenges of my life, the DK200; what can you eat to replace so many calories while riding? How much water will I need to keep from becoming dehydrated? Most endurance activities take place at 70% of VO2 Max. What is VO2 Max? VO2 Max is the maximum capacity of an individual’s body to transport and use oxygen during incremental exercise (VO2max 1). For example, when I am exercising and cannot easily carry on a conversation I have past 70% VO2 Max. During a 70% VO2 Max activity, I can process between 200 and 300 calories per hour. Taking on any more than this will cause my body to divert energy away from the muscles doing work, to the stomach and intestines. If I try to take in more calories, my stomach gets sour and bloated. So, what are the best 200 to 300 calories to eat or drink? My favorite foods to eat or drink while riding are; Gatorade, Hammer Nutrition Perpetuem or Heed drink, half a Clif Bar, a Hammer gel, fruit, nuts and other small whole foods. It’s not just what you eat, but what the food is consists of, like the carbohydrate to protein ratio and what type of each are present. The ideal ratio of carbs to protein is 85% – 15%. You can get protein from a powder, a bar, or some energy drinks. Amino Acids and Caffeine are also important to endurance activities. Amino Acids can easily be converted to glucose in the liver. Glucose is a simple sugar that the body can absorb directly into the bloodstream. Caffeine can enhance endurance by helping the body to use free fatty acids stored in the muscles for energy, therefore sparing the stored muscle glucose. Most research suggests caffeine intake should be 3-9 mg/kg of body weight or the equivalent of two to six regular size cups of coffee. When I ride I will eat Clif Bars and energy gels on shorter rides of 2 hours or less. On longer rides, I add a water bottle with an energy concoction. The bottle contains a mixture of Optimum Nutrition Glyco-Maize (Complex Carb powder), Optimum Nutrition Amino Energy (Amino Acid and caffeine powder) and an electrolyte drink, like Gatorade. The extra bottle adds a few calories, caffeine and other nutrients in a convenient drink. When it comes to endurance nutrition, here is the big shocker: You will not be able to eat and process enough calories during exercise to replace all of the calories you will use. You may have figured this out when I use the footlong sandwich example. I mean, there is no way I could eat 6 footlong subs in a day, let alone 38! I’m about 200 pounds and will burn 750-1100 calories an hour cycling at a moderate (70% VO2 Max) to vigorous pace (Cycling 1). Let’s say each hour I burn 1000 calories and can only eat 200 calories. Where will the other 800 calories come from? The answer is Fat, and I don’t mean PHAT fat! Your body can store up to 100,000 calories of fatty acids that it can draw from when needed. Think of a hibernating bear. It eats and stores fat all year to use during hibernation. Endurance athletes will use the fat they store to pay for the caloric deficiencies created during prolonged periods of exercise. Like the bear, fatty acid stores cannot be built in one meal, one day, or even one week. Fatty acid stores are constantly changing depending on your activity level and percent body fat. Just maintaining a healthy level of body fat is enough to maintain your fatty acid stores. The final component required to keep the body going during exercise is water – good ol’ H2O. The body can require up to 64 ounces of water per hour during exercise. This is a huge number, because of the varying conditions we can be exposed to during exercise. I drink 16 to 30 ounces of water per hour to keep the system running, depending on the temperature. Wow, this nutrition thing is complicated! Here is a summary to get you on the endurance exercise train. If you can’t talk and exercise, then you have exceeded 70% VO2 Max. The body can consume and process about 200 to 300 calories per hour in an 85% – 15% ratio of carbs to protein. Amino Acids and Caffeine can enhance endurance. The rest of the calories you burn will come from the fatty acids stored in the body. During moderate to intense bouts of endurance exercise, a 200 pound person will burn 750 to 1100 calories per hour. The body will require 16 – 64 ounces of water per hour, depending on the conditions. Let me take you back to the previous blog post for a minute regarding the Syllamo’s Revenge race. If you recall I mixed a water bottle with an energy drink mixture. It contained all the good nutrition items discussed above, less the protein, because I was getting that from another source, Cliff bars. The bottle was supposed to be drunk over a 4 hour period. I drank a bit too much of it too fast and it caused a sour stomach (bloating, cramping, etc). This is described in better detail in the excerpt from the article CALORIC INTAKE – PROPER AMOUNTS DURING ENDURANCE EXERCISE on Hammer Nutrition.com: “I’ll just mix a stronger concentration (energy drink). But this approach also fails. Making a double or triple strength mixture carbohydrate fuel won’t work. It is far too concentrated and it will remain in the stomach until sufficiently diluted, which may cause substantial stomach distress. Drinking more water to dilute your over concentrated concoction puts you back in the original condition of increased risk of over hydration. But if you don’t drink more, your body will draw fluids and electrolytes from other areas that critically need these fluids and electrolytes (like blood and muscle) and divert them to the digestive system. This also will result in a variety of stomach distresses, not to mention increased cramping potential and other performance trashing issues” (Caloric 1). So, too much of a good thing is a bad thing! The DK 200 will cover 200 miles of Kansas gravel over about 15 hours and I will burn more than 17,000 calories. I will need all the nutrition knowledge I have, and a little luck, to complete the race. The next article is a big one as I will cover the DK200 race days for 2012 and 2013. That’s right, it’s a twofer! Two races in one article, can you wait? Caloric Intake – Proper Amounts during Endurance Exercise.” Fuels & Supplements for the Endurance Athlete. Hammer Nutrition, June 2011. Web. 12 Nov. 2013. “Cycling – Calories Burned Bike Riding.” Cycling – Calories Burned Bike Riding. NutriStrategy, n.d. Web. 12 Nov. 2013. VO2max.” Wikipedia. Wikimedia Foundation, 13 Oct. 2013. Web. 12 Nov. 2013. This entry was posted in Events, Fun Stuff, Opinion and tagged Caffeine, Carb to Protein Ratio, Cycling, Dirty Kanza 200, endurance training, gravel grinding, Nutrition, VO2 Max by Tim King. Bookmark the permalink.